Do You Ever Dream of Finding Work Abroad? 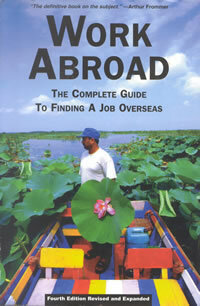 "The definitive book on the subject..."
"One of the richest resources for finding an overseas job - an outstanding guide to both short and long-term jobs abroad. My advice: don't leave home without reading Work Abroad. it will ... change your life." — Ronald L. Krannich, Ph.D., author, Jobs for People Who Love to Travel. "Whether it's for an interesting volunteer position or paid employment full or part-time, this indispensable guide is an ideal and instructive reference." "Details resources for overseas job seekers." an extensive list of reference material dealing with working abroad." "The reference bible for international job hunters." "Covers all aspects of international work." "Work Abroad: Always a tantalizing possibility, yes? Here's savvy advice on your chances, complete with suggested preparation and necessary connections, by region and country, right down to websites and phone numbers."